Starting with the first-generation NanoBridge®, Ubiquiti Networks pioneered the all-in-one design for an airMAX® product functioning as a CPE (Customer Premises Equipment). 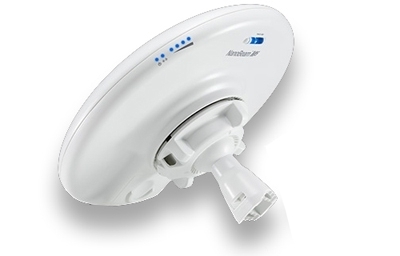 Now Ubiquiti Networks launches the latest generation of CPE, the NanoBeam. Dish Reflector Design Ubiquiti's InnerFeedâ„¢ technology integrates the radio into the feedhorn of an antenna, so there is no need for a cable. This improves performance because it eliminates cable losses. Providing increased performance from its faster processor and innovative mechanical design at a low cost, the NanoBeam is extremely versatile and cost-effective to deploy.